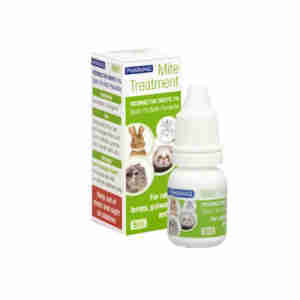 Ivermectin Drops are for the treatment of fur, ear and mange mites and lice in rabbits, guinea pigs, ferrets, chinchillas and rats. The drops are easy to apply using the dropper nozzle. A very cost effective solution, with enough product to provide a full course of treatment to 50 birds. Can also be used prophylactically. Apply the appropriate dose (one drop per 500g bodyweight) on the back of the neck, between the shoulder blades, once per week for three weeks. Do not allow the animal to swallow the product. Ivermectin Drops can also be used prophylactically to prevent reinfestation. It is advisable to treat any new rabbits or Guniea pigs that you introduce into your colony, or whenever your pets may have been in close contact with other rabbits/Guinea pigs e.g. shows. Do not use on pregnant or lactating animals. Do not use on other animals other than those indicated above. Ivermectin 10mg/ml in a propylene glycol base. Absolutely brilliant would recommend this for mites in birds. Fantastic change in our bird in three weeks. Fast delivery. Budgies were subdued for a few hours after each treatment, then back to their lively selves. Symptoms have cleared. One of my rabbits had a mystery rash and my vet was delighted that I was using Invermectin because the Advantage that she usually prescribes for rabbits is great for fleas but ONLY fleas. Invermectin kills all parasites :) I can use it on all of the fur babies and the chickens too so it beats all of the other products hands down. If you are using it on your chooks, don't eat the eggs for 7 days or the meat for 28 days!